With bicycling listed as the second most popular outdoor activity in the US, it only makes sense that sometime in the possibly not-so-distant future you will be looking for a new bike for your child. When you first start looking, the massive wall of bikes at your bike shop or retailer can be overwhelming to say the least. There are a lot of options to choose from and it may be difficult to know which one is right for your child if you aren’t sure what to look for. The most important thing and first decision to be made is about the size of the bike. Bikes for children are measured by the wheel’s diameter and can be from twelve to 24 inches. The size you’ll need depends on your child’s age and either his or her height or leg length. An easy example – a two-year-old will likely start on a 12-inch bike. To make sure the bike has a proper fit with your child, have he or she sit on the bike with hands on the handlebars. A bike that is a good fit will allow your child to sit comfortably on the bike with both feet on the ground. Safety is also very important and no bike purchase is complete without a helmet. 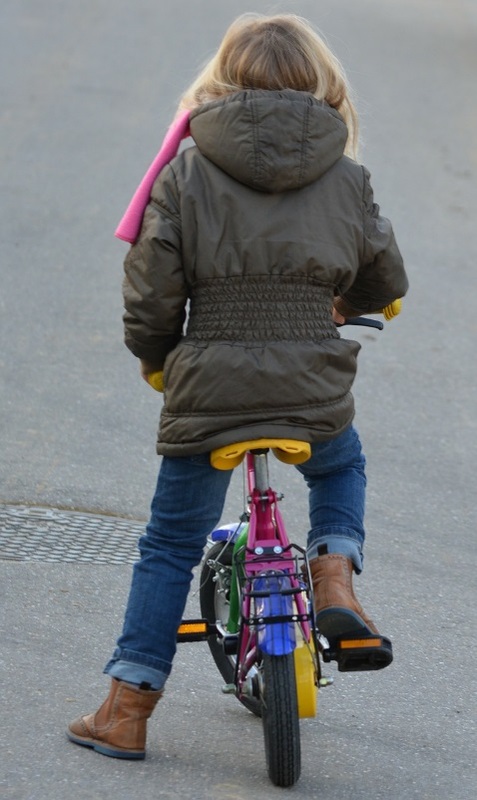 By purchasing a helmet with your child’s first bike, you are setting them on a course of good, solid habits early on, not to mention, some states – like Maryland – require helmets for any bike riders under the age of 16. Helmets can come in all shapes and sizes so be sure to pick one that fits properly: it should be tight against the back of your child’s head while the front is parallel with the eyes. The helmet should also sit two fingers’ width above your child’s eyebrows. You may also want to consider bells or horns for your child’s bike as a further added safety precaution. It never hurts to have your child get in the habit of alerting people that a little one is scooting by.